Skipping the alliteration for a post, we’ve taken a temporary detour to the anagram. 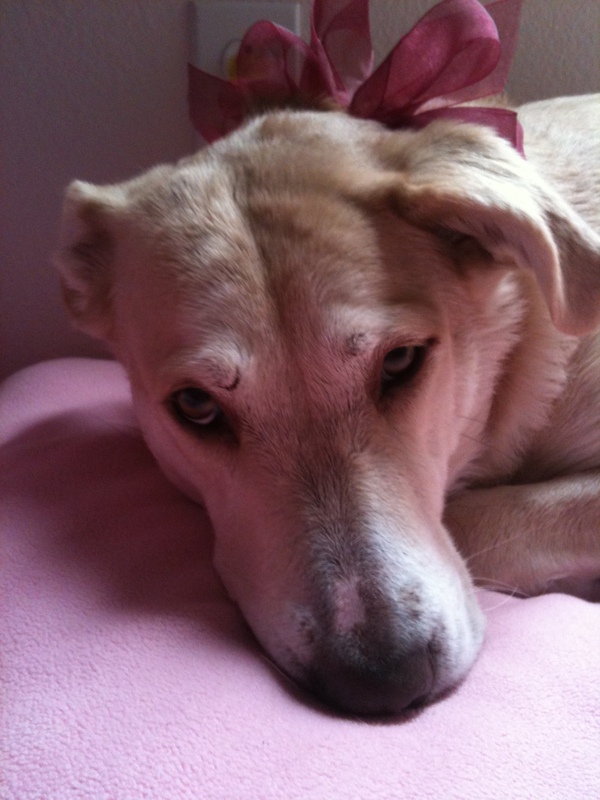 Here’s the story of how my dog ate God…. My neurotic rescue, Sadie the Silent Wonder Dog, would react in fear by stealing and chewing my possessions under the cover of darkness. She had a particular fondness for chewing anything of mine that was leather. She would steal a shoe here, a Coach purse there (I know you feel my pain!). There was an incident in the past where she stole my favorite Bible and chewed on the corner. As I was running after her to repossess my stolen possessions, I was thinking “you better be filled with the Holy Spirit now because I’m a-gonna kill you!! !” something always stopped me from reacting with her. I’m sure it has a lot to do with the ever-present sorrowful “don’t hit me” look in her eyes. She was used and abused and has severe distrust of humans. It got me thinking, we as humans say some terribly unkind things to one another. Why is it so easy to for me to catch myself from reacting to Sadie’s antics, and not as easy to stop reacting when another human being wrongs me? Why is it so easy to connect to an animal? Is it simply because they offer unconditional love? Why is it such a challenge to do the same for another human? Dogs don’t disappoint the way humans do. But is that really true? Or do we just have different expectations with dogs so there isn’t as much pressure on them to be a certain way? Over time, dog has become my second shadow. Part of that is because she’s still fearful of other humans and hides behind me for protection, but I believe she’s finally begun to trust me. Dictionary dot com defines trust as reliance on the integrity, strength, ability, surety, etc., of a person or thing; confidence; confident expectation of something; hope. This particular verse is a favorite of many. The text has an obvious message, but it wasn’t until recently that someone helped me see this in a slightly different way. If you look in the verse before this (29:10), you come to learn that Jeremiah is sending this message to the people (Israel) that have been held captive in Babylon. Though captive, they have been asked to remain faithful to God and to obey his word in the culture they were transplanted to and held captive by. Babylon had a reputation for the excessive (sound like anything we’re dealing with today?). God is promising to deliver them from 70 years of captivity. 70 years spans several generations. There would be some that were sons and daughters that had never lived in the Promised Land; these would have been born in captivity. God is offering hope and a future, but he’s asking that the people Israel trust him, sight unseen in some cases. Doesn’t that sound a little like what we’re dealing with today? We’re the sons and daughters that have been born into the captivity of the culture of excess around us. As believers, we’re being asked to live a little differently from the culture around us and place our trust in something the rest of the world simply doesn’t understand and probably thinks is a little weird. And even though we’ve never lived in the Promised Land, we are being asked by God to trust him, sight unseen. And whether our proverbial captivity extends 70 years or beyond, we are being asked to trust. We are being asked to rely with integrity, strength, ability, and surety in Christ with a confident expectation. We are being asked to put our hope in Him. God wants you to prosper dear one. He’s asking you to trust Him to do so. Sadie is developing a confident expectation in me and I in her. She’s acting out less and less. She’s slowly becoming more interactive and affectionate. She follows me everywhere I go. I’m quite certain that she was placed in my life as an experiential teaching tool, to give me a picture of what it means to love unconditionally, to change and evolve. Something analogous to the expectations that God has for me, the plans to prosper me, to give me hope and a future, provided I remember where my trust belongs. I would like to take it a step further and suggest that if we place our hope in Christ, it helps us manage our expectations; of self and others. If we can remember that we are essentially as captives in the Babylonian-style world and called to live a little differently, it may serve to help us keep our expectations in perspective and focused on God. People disappoint sometimes. God doesn’t. I believe if we can learn to relax our expectations of others, and remember that they are in this same struggle of captivity that we are facing, it may help us choose a different reaction, perhaps a more kind and loving response….perhaps we can come to trust God and use that trust to seek wisdom in our response to others. Now I’m going to go swallow my own medicine. And hug my dog. Don't miss out on a single post! Please subscribe by entering your email address in the box below and then clicking on the 'Sign me up NOW!" button! Thank you! Subscribe Via RSS Feed by clicking here! anagram Babble On Babylon Bible Bread Bread of Life Brownies carob Chicken Soup Christianity coffee Comfort Food Corn Chowder corn tortillas cranky pants cravings c s lewis Devotional Distress Dog food Food; Recipe gringo salsa healing hidden gems holiday Hope Jeremiah Jeremiah 29:11-14 jeremiah was a prophet JOY! latte lavender love organic organic tofu patriotic philip yancey pickled carrots recipe relationships response saving face Scripture Shewbread stew Tofu tofu slices trust Vegan Vegetarian Veteran Whispers YUMMY!